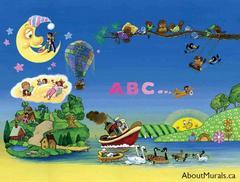 This wall mural is perfect for your little super star. 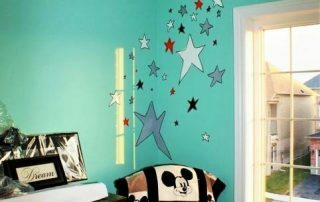 Painted in Toronto, silver, gray, white and orange stars are scattered over turquoise walls. 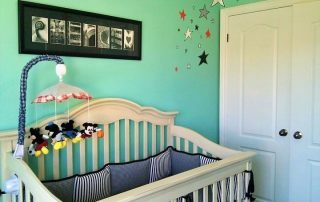 Tara wanted stars painted throughout Pierce’s nursery, but didn’t want them perfectly symmetrical. And she didn’t want a mural painted as a feature wall…she wanted them on all walls. The crib bedding was black and white, so I pulled those colours in along with some silver, gray and orange stars. 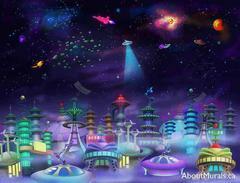 For this wall mural, I painted groups of stars here and there throughout the room. Some were added over her rocking chair, some next to the crib and some behind the door. When painting my kids wall murals, I love getting the parents and kids involved. I’d call Tara in every so often and ask if she liked where the stars were placed. She would ask me to add a few more here or there and even had the idea to put some behind the door that Pierce could enjoy when he was in bed and the door was closed. 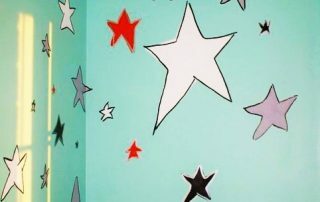 Wall murals with stars can be painted in so many ways – totally symmetrical, different colours (or just one colour), in a pattern, in an outer space theme. This mural starting from $350.